After a one-year hiatus, Shinpachi Shimura returns to Edo, only to stumble upon a shocking surprise: Gintoki and Kagura, his fellow Yorozuya members, have become completely different characters! Fleeing from the Yorozuya headquarters in confusion, Shinpachi finds that all the denizens of Edo have undergone impossibly extreme changes, in both appearance and personality. Most unbelievably, his sister Otae has married the Shinsengumi chief and shameless stalker Isao Kondou and is pregnant with their first child. Bewildered, Shinpachi agrees to join the Shinsengumi at Otae and Kondou's request and finds even more startling transformations afoot both in and out of the ranks of the the organization. However, discovering that Vice Chief Toushirou Hijikata has remained unchanged, Shinpachi and his unlikely Shinsengumi ally set out to return the city of Edo to how they remember it. With even more dirty jokes, tongue-in-cheek parodies, and shameless references, Gintama' follows the Yorozuya team through more of their misadventures in the vibrant, alien-filled world of Edo. This is the second season of Gintama. In the episode continuity corresponds to episodes 202-252 of Gintama. When you REALLY love a certain anime and hear it's going to end, you weep a little inside. So is Gintama, and the news of the new season were salvation to many sad Gintabros all over the globe. That's right. The #1 show is back - and I am damn excite, son. To any of you who haven't watched the first season, please do. but if you wouldn't want to commit yourself to a 201 episode show, feel free to just skip ahead to season two and try an episode or two. The storyline's arranged in inconsistent arcs, meaning you can pick it up from any arc - as long as you get an explanation on the origins of the different characters. I assume all of you know the general setting - a Samurai who lives in a modern era in which aliens are a part of our (humans) daily lives. There's an ongoing ban on swords, so being a Samurai is obviously forbidden by law. Though there's no rule against a wooden sword, is there? In the last year, our friendly studio Sunrise had enough time to stack up material for a long-lasting second season, while our beloved mangaka had time to improve and write arcs which without a doubt - have the Gintama effect. Holding tears in your throat, and two minutes later laughing like a maniac - only to be in tears again a few minutes later. The long touchy speeches are back, the unexpected plot turns are back, everything we longed for in this Gintama-less year, is back. It might be important to specify the fact that Gintama is now well funded, and is in HD. Can you imagine seeing Gintoki pick his nose in 720p?! Insane!!! The first arc is the comeback we all wished for, every character you knew is making an appearance, though you should ready yourself for a surprise - they've all changed. I promise this - starting at the first 15 seconds up to the end of the 24 minutes of awesome, you'll be smiling, laughing, perhaps even crying if you're touchy. Enjoy. Edit after episode 13: I cried big wet tears at the excellent storytelling and well placed character development. SUCH. BIG. TEARS. I was skeptical as hell for the return of the Gintama anime. To be honest, I went into this anime wanting to slam it as hard as possible, especially upon seeing it's overbearingly high-score. But I won't, because to be frank, I can't. I don't really think a lot of reviews, complex and heavily-illustrated need to be written about this anime to get a feel for what it's about so let me get straight to the point: It's ridiculous over-the-top comedy, plain and simple. Of course you can't forget the awesome stories built from these insane gags, too. The scripting, the scenario, specifically the way that the anime envelops you inside - making you a returning character as well, are all ingeniously meshed together. And of course, after five years... brought to you in 16:9 format. ...With even better songs than ever (hard to believe, I know). If you haven't seen Gintama before, I recommend checking it out, and I know 201 episodes sounds like a grueling task, but after seeing the pilot episode for the second series, I was left more than satisfied. This episode is reason alone to watch the over two-hundred preceding it. 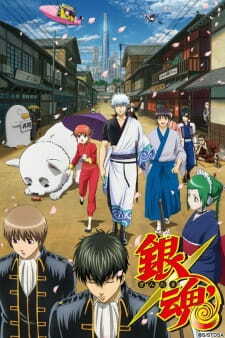 Even if you're familiar with Gintama and think you're ready for Gintama', let me be the first to tell you; you aren't. Note: I don't believe this review needs to be edited every week, as most episodes are either episodic or self-contained within an arc. If you've braved the first 201 episodes, don't miss season two. Gintama and Godly both start with G, coincidence? This anime is the pure essence of entertainment. You will laugh, you will cry, you will become emotional invested in a variety of ways. Not having watched this anime is like missing out on a classic movie and that means that you haven't fully lived yet. I watch an episode every night before I go to sleep so that I can sleep in pure comfort and relaxation. Watching Gintama for me is not a hobby. It is a life style. I HIGHLY recommend this show to anyone who likes anime and especially comedies. I began watching this anime, unfortunately, so late.. So I couldn't feel the excitement you get when you're waiting for something you love.. and I LOVE Gintama.. from the very first episode till the end, Gintama kept me interested, made me lmao and sometimes even cry (even though at the end there was always a twist ^^) It has everything you can expect from an anime in it.. Definitely one of the best (for me the best) anime, and if you're not watching because you think that it is overrated, the only thing that will take to change your mind is the very first episode..
People, just give it a try, I guarantee that you definitely will not regret.. Note: If you guys don't make a third season, Sunrise, I will look for you, I will find you, and I will kill you. Japanese New Year is a time to appreciate and celebrate by giving gifts to others. Who doesn't love birds? Complete monsters, that's who! So if you're not a complete monster, you might be interested in looking at this writer's list of some of the best manga and anime birds, right? Time to bird up!